(CNN) -- In an appeal to the tech-savvy public, the White House's Web site opened itself to Internet-submitted questions for President Obama's online town hall meeting Thursday morning. Obama began taking your questions in an online town hall meeting at 11:30 a.m. ET. The virtual meeting -- which was a new take on President Franklin Roosevelt's fireside chats -- reached out to online followers as Obama tries to rally an anxious country in support of his solutions to the economic crisis. Obama began his address by trying to draw a clear line between what he sees as the political games of Washington and the actual needs of the American people. "What matters to you and your families and what people here in Washington are focused on are not always" the same, he said, criticizing the winner-loser mindset of the politicians in the nation's capitol. "This isn't about me, it's about you," he said. "It's about the families whose letters I read every single day, and, for the American people, what's going on is not a game." Obama had promised to answer popular questions from the site. The idea that a president would want to talk directly to the American people has been around since the days of FDR, but what was new about Obama's online town hall is that it encouraged members of the public to interact with each other, said Julie Moos, director of Poynter Online, a nonprofit journalism site. Time: Is the president doing too much TV? "By allowing [Internet users] not just to submit questions but to see the other questions ... and to rank the questions continues to connect them in the same way that the [Obama] campaign did," Moos said. "And I think that's one of the most innovative things that they're doing." The president grinned through his answer: "I don't' know what this says about the online audience," he said, adding: "The answer is, 'No,' I don't think that is a good strategy to grow our economy." iReport.com: Is it time to legalize marijuana? Other questions -- some of which came from the live audience -- focused primarily on health care, job loss, mortgage payments and energy. A video question from three bubbly college students was well received by the audience. In it, the young women asked how Obama will make college more affordable and when a national program may start. Obama said too many college students finish school while drowning in debt. He said a public service program will begin in a matter of weeks. "If you come out of college with $50,000 worth of debt it's then hard for you to start making a decision about wanting to be a teacher or wanting to go into social work," he said. In one video question, a woman asked the president if manufacturing jobs that have gone overseas will come back. America needs to create new jobs "that can't be outsourced," he said. Many of those will be in the renewable energy sector, he said. During the address, the online community commented on Obama's answers and the format of the town hall. 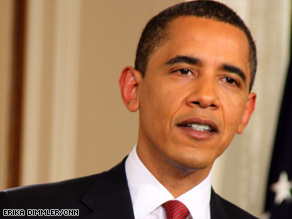 Users could watch streaming video of the question-answer session online at WhiteHouse.gov as well as on CNN.com. On the social media site Twitter, a user named kfoggy1 wrote: "[I] didn't vote for Obama, but I really like what he is doing with technology. Good for democracy." A user called BeaconOfLight was less impressed. "Another chance for Obama to get TV time. Get your glass the 'kool aid' will flow," the user wrote. A quick survey of the more than 104,000 questions submitted at WhiteHouse.gov revealed an America troubled by the state of the economy and struggling to make ends meet. The White House asked the public to submit questions only about the economy, but the site divided them into several subcategories. In education, several popular questions came from people who criticized the state of the nation's educational system, or were having trouble paying off college debt. "The Founding Fathers believed that there is no difference between a free society and an educated society. Our educational system, however, is woefully inadequate. How do you plan to restore education as a right and core cultural value in America?" asked Takeok, from Boston, Massachusetts. In the "home ownership" category, several users wrote that they feel they've been making all the right financial moves and still find themselves in turmoil. "Why aren't you helping the people who want to PREVENT foreclosure?" asked MistyLee, from Providence, Rhode Island. Some health care submissions questioned why more Americans aren't covered. Questions filed under green jobs and energy prodded the president to reconsider ethanol subsidies and asked him to explain how the stimulus plan will affect green jobs and home weatherization. Larkin, a user from Gaithersburg, Maryland, was one of several people to raise the issue of public transit. "Will we ever see high-speed passenger rail service in the U.S.?" the user asked. In the finance category, Web users wanted to know more about why the government couldn't break up large financial institutions into smaller entities. Adrian, of Collinsville, Illinois, worried about businesses that have survived the economic collapse. "What rewards are there for those people and businesses that chose to live and operate within their means?" the user asked. The site began taking questions on Tuesday and stopped on Thursday at 9:30 a.m. ET. The Web service was hosted by Google, but the White House said it will protect user information in accordance with its own privacy guidelines. Questions asked on the site were made public immediately, the White House said. Users could flag questions they deemed inappropriate. Moos, of Poynter, said one of the biggest take-aways from the event is that it connected these audiences to the president and a sense that they're part of a valued online community -- an engaged citizenry.